The Queen's Hope Diamond has been stolen! 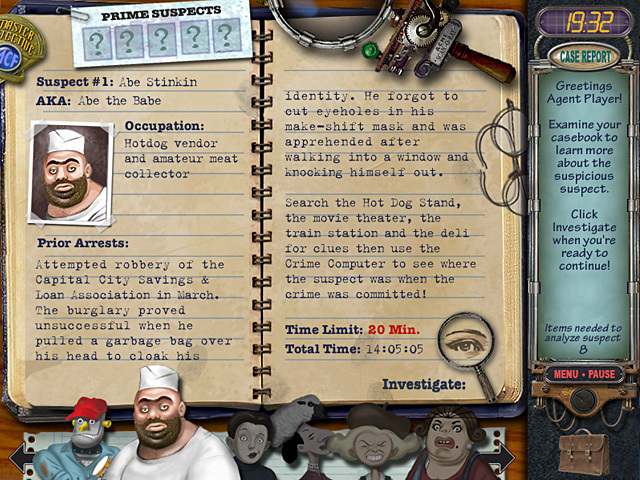 It's up to you to search for clues throughout 22 levels, find the offending culprit, and recover the stolen gem in Mystery Case Files: Prime Suspects™. Expand your investigations through the game's 29 unique locations by finding items that will unlock subsequent levels. Thousands of clues are cleverly hidden within the beautiful illustrations, creating a new game experience each time you step into this masterpiece of visual indulgences! 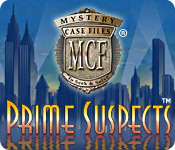 Mystery Case Files: Prime Suspects ™ is rated 3.8 out of 5 by 53. Rated 5 out of 5 by paris2727 from fun game but no walkthrough I really like this game but wonder why it has no walkthrough is it because its an older game? I wonder anywho ITS an awesome game my 3 year old gets a kick out of playing it she loves the HOS and I love playing with her its our before bed time game thank you big fish we are new to this and love love love it!!! !.EricT and Daughter Iona. Rated 5 out of 5 by Ripcean from One Of The Best HOGs This game unlike MCF Huntsville (the first in the series) is not monotonous. There are different puzzles at the end of each stage, which makes it a bit more interesting. I must say that I disliked playing only HOGs since criminal case but big fish has made this awesome. I thoroughly enjoyed playing this even after so many years of its release. These games are more of a challenge than actual fun. Rated 5 out of 5 by beebelle from Just as I like them If people want an adventure HOG then this might disappoint, but I don't want to have to figure out what I'm searching for and why, or get objects I'm going to need on another level. I like the relaxation of finding the objects within a time limit with a bit of story around it. The graphics are particularly good in this game and I like that there are no moving objects. Please make more like this for people like me. I have money and I'm ready to buy, but I do the free trial of the more complicated games and they don't fit the bill at all. Rated 5 out of 5 by BellaMorte from I'm Biased And I am. I love this game. I, personally can't fault any aspect of this game. I love the graphics, the storyline is good and fun. Rated 5 out of 5 by mouser9169 from If you want a pure HO game, this is the one. This review is based on a complete playthrough of the game. I'm more a HOPA player than pure HO, but I got this during a MCF sale and I'm glad I did. Much better than Huntsville. THE GOOD: Lots of locations, and they do a good job of shuffling them from one 'suspect' to the next so you're not going through the same scene back to back to back (some HOPA developers could learn from this...). There's only one difficulty mode (they added 'relaxed' in later games), but the time control is much easier than Huntsville. It gets harder as you go, but by then you've seen the scenes a few times, so you can go through them faster. Where Huntsville was try after try after try till I got it, I only had to repeat maybe four scenes my entire playthrough. Some cut it close - I'm not saying it was a cakewalk, but more realistic time controls for us mere mortals. I ended up last visible 'agent' on the time sheet when I was done, so there's loads of room for improvement if I ever play it again. If you do 'fail' a level, you try again with different objects - so you can't look to a strategy guide like you can with a lot of more modern HOPA's to point out where everything is. Ditto if you replay the game to beat your time. Different puzzles at the end of each level: either a picture scramble, concentration, or a word find. The 'final' puzzle (at least the one I got - there may be different ones), unfortunately was terribly easy if you've ever seen it before, and I think they give you the clue to the solution somewhere along the way if you pay attention. THE BAD: Graphics are a little grainy by today's standards. As I said, I'm not so much into the pure HO, but I gotta think that if one of the big three or four publishers put out a pure HO game in this style with today's sharp graphics, a lot of people would eat it up. Sound got very repetitive, and the loop 'broke' from time to time (maybe because I took so long). THE UGLY: There were a few minor issues with ambiguous objects (a time clock or a wall clock for 'clock), and they recycled a lot of the 'art' from Huntsville. BOTTOM LINE: For what it is - a pure Hidden Object game with no pretense of a plot - other than improving the graphics I don't think it can get much better than this. And that's saying something considering the year of release of this game. Rated 5 out of 5 by pennmom36 from An Oldie But Goodie! I'm a new found fan of Mystery Case Files because of Fate's carnival. I have gone back to play all of these MCF since, and although I enjoyed the atmosphere of Fate's Carnival, this game has the same concept. 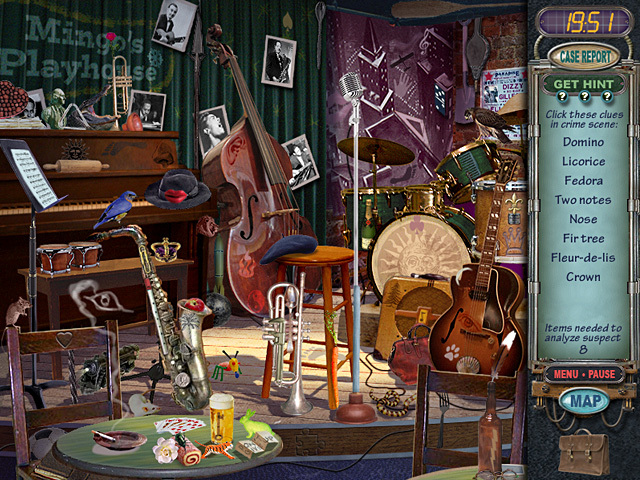 I love the fact that you really only have to do hidden object scenes and mini games. Each scene is timed and you have to locate the items on the list, that's it, no adventure just scene after scene to please all the fans of this genre. Great game, enjoy! Rated 5 out of 5 by pamiam101 from best of the hidden object games I love this game. I play it over and over. The game itself is fun but I also love the cheeky little fun games at the end of each chapter. I think many more games should be like this. Fun and not serious. Rated 5 out of 5 by KayceB from Madem Fate Mystery Case Files Loved this game which is the one I started with Big Fish and been a customer since then!! Rated 5 out of 5 by PFKThorin from Great Hidden Object Game Really enjoyed this one. 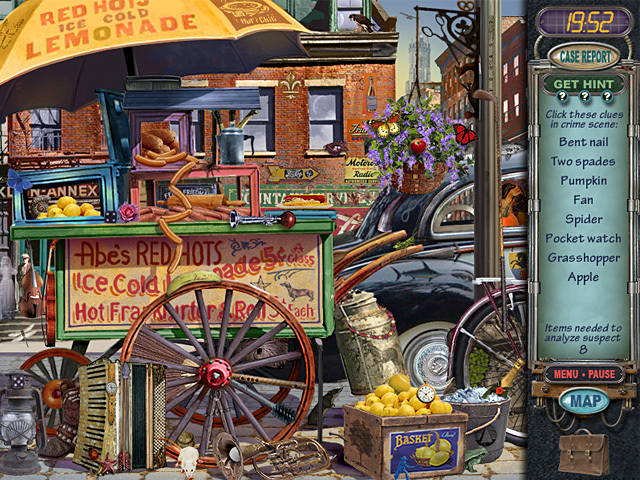 The puzzles were fun, the hidden objects were challenging to find, and the art was done well. Great job!